Where was I? Right. The pleasures of watching a show (or reading a story) where the writer says, “What the hell, why not?” They are many. As you may remember from my rantings from Season One, two of the worst things about this show were Rip Hunter, Worst Team Leader Ever, and Vandal Savage, Worst Antagonist Ever. (There were also the Hawks, but they’re gone, so enough about them.) Savage is also gone forever, killed three times, but not forgotten in this episode, and Rip’s been missing all season, so that was lovely, but in this episode Rip’s back. See, Rip knew he had the Spear of Destiny in his underwear drawer and the only way to keep it safe from the Legion of Doom was to hide it and then wipe his memory so he was no longer Rip Hunter. Let us take a moment to look at the genius of that bit of writing. You have a character who is just an annoying putz, despite the charm of its actor. So you wipe the putz’s memory, and give the actor a role to play that he is going to grab onto with both hands and run like hell with. After loathing Rip Hunter in every appearance he made in spite of being a fan of Arthur Darvill, the actor who played him, I watched him come back in this episode and he’s marvelous. Of course he doesn’t know he’s Rip Hunter. He thinks he’s an American movie director named Phil in 1967. Oh, and he also has a prop guy named George to whom he gave the Spear of Destiny because since his memory was wiped, he doesn’t know what it is. (It’s the spear that pierced Christ’s side during the crucifixion and now it can rewrite reality. Just go with it, okay?) This lack of forward thinking would be annoying–Rip Hunter, Worst Team Leader Ever–except it’s completely in character and Rip’s pretty much gone. Phil, however, is all over the place, funny as hell, the best thing I’ve seen Arthur Darvill do since Doctor Who. Honestly, watching this episode is worth it just to see Darvill nail an American accent and then freak out repeatedly as he’s attacked by otherworldly beings while trying to shoot a movie about a group of time travelers who are threatened by a mustachioed villain who’s really bad. Or as Phil says, “I can’t seem to get Peter to bring any menace to the part . . . . A film is only as good as its villain, and I have an antagonist who is as threatening as a weiner dog.” Then Dahrk and Merlyn show up and are snide and Phil says, “You see, this is what I’m talking about. These guys are good.” If they hung any bigger lampshade on last season’s problem, it’d be a chandelier. Then the cops show up and arrest Phil/Rip, who starts to scream. I LOVE PHIL. So far, it’s just fun. But then it gets interesting because Ray and Nate start to get dumber. And it turns out that the reason that Ray became a genius scientist was that he saw Star Wars and it changed his life. And Nate became a historian because he saw Raiders of the Lost Ark and it changed his life. And that prop guy name George? That was George Lucas who was so terrified by the laser fire in the kidnapping attempt that he left film school and never made those movies. So now they not only have to save Phil/Rip, they have to talk George Lucas back into film school or Ray and Nate will be goobers and no good to the team. Also, George thought the Spear of Destiny was just junk, so he put it in the trash. Which leads to a scene of three guys and a cranky, pro-active girl in a trash compactor. There’s a subplot of Mick forcing Stein to be a psychoanalyst/brain surgeon to get rid of his visions of Snart, also fun–Sara, seeing Stein poised with a scapel over Mick’s bald head: “What are you doing?” Stein: “Brain Surgery.” Sara: Shrugs and goes to save Phil–although whether Snart is a hallucination or something more real is still up for consideration. But the real fun here is the writers pretty much ripping up the last season and saying “Hey, it’s a whole new story,” and the Legion trying to outsmart Merlyn and Dahrk, who are not only lethal but also masters of snark. Even five seconds of the two of them just standing in an elevator is good entertainment. Sara is a badass leader, the team works together well while bitching at each other, the antagonists are awesome, and all of it is absolutely, wonderfully ridiculous. The scene where they find George Lucas in a parking lot and Nate jabs a finger at him and says, “Stay in school!” is just one of dozens of great moments. Amaya saying, “You’re our only hope,” is good, too. And then there’s Sara saying, “Oh, great. George Lucas has the Spear of Destiny.” And it all ends with a great reversal. The writers are just on fire. 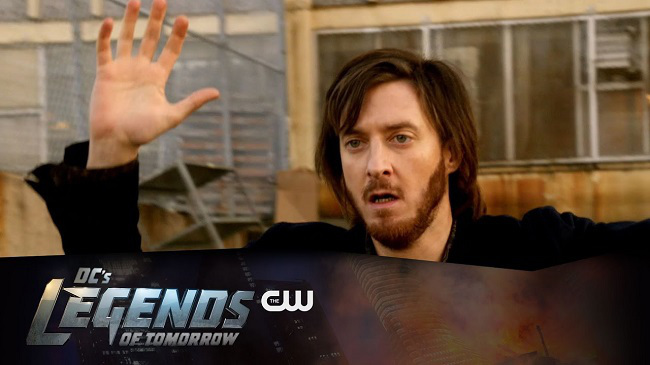 The Legends are pretty much sidelined in the episode, which is okay because the Legion is great, bickering among themselves, terrorizing Phil, and finally discovering why Thawne’s so uptight all the time, ending with another major reversal as they mess with Rip’s brain to give him back his memories plus a side order of villainy so that he goes back in time and kills George Washington. Well, you had to be there. Bottom Line: I’ve never seen a show this insanely willing to say, “What the hell,” and just go for it, and I’m enjoying every minute of it. I would not touch a thing. Once you have a clear protagonist and a clear antagonist, in this case, two teams, and you’ve established wonderfully individual characters within those two groups, you can pretty much swing as wide as you want. The characters will keep people reading even as reality goes spiraling out of control. As long as the internal consistency of the story and its characters is stable, you can do anything. Like give George Lucas the Spear of Destiny in a trash compactor. Now all they have to do is bring back Snart . . .
Is Alex Kingston’s Arrow character still alive? Clearly we need every Berlantiverse Dr. Who alum to show up in this season’s Legends. Too bad Karen Gillan’s already signed up with Marvel. She’s still alive, but I’m not sure how useful she is. She was always off screen, and now they’re bringing in a new Black Canary (hey, third time’s the charm) and Laurel’s dead and evil, and Sara’s alive and on Legends and Quentin’s in rehab and then back in the mayor’s office, so there’s not a lot of reasons for her to come back to Star City. Still we have Arthur Darvill and John Barrowman in there. And the Berlantiverse is clearly open to British legends: Draco Malfoy just joined the Flash team. Off Topic – The Xbox One gaming system has this ever growing game call Lego Dimensions. They got licensing from Doctor Who, Harry Potter and DC Comics as well as a LOT of other franchises. And there are Lego mini-figures you put on a platform to active and form a team to defeat the current story line. We rec’d a free Green Arrow figure. When he’s on the platform with the Doctor, he says something about Hey, I know a friend of yours! Capt Jack! Green Arrow also reassures Harry Potter than even though he wears green, he’s not in Slytherin. The Dcotor Who worlds/game in there is actually pretty decent. There’s a super creepy part with the Weeping Angels. Sadly, you’re rescuing Clara though. The Weeping Angels can have Clara. I’m also enjoying it a lot. All they need is a dog. Or at least a ship’s cat. As soon as the Damian Dahrk voiceover began, I thought, ‘oh, I hope Jenny writes about this episode!’ So good! And while I was a little disappointed your theory that it would be Merlyn who would come up with the name Legion of Doom, I can buy Nate coming up with the name and love Sara’s resistance to it! Gah, should really finish sentences! I was a little disappointed that your theory that Merlyn would come up with the name Legion of Doom didn’t happen! This is so much fun. Arthur Darvill was the best kidnapping victim ever. 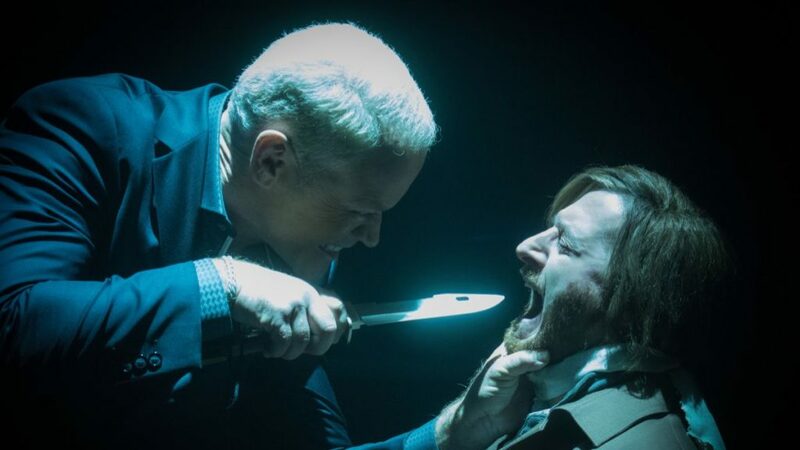 My favorite part might be when he calls time out on Darhk and Merlyn trying to kill each other then tells them “neither of you is Clint Eastwood” and counsels them on their problem with Thawne. He’s just so much better as Phil. And now he’s Rip again, but at least he’s Evil Rip. Plus he’s the Legion of Doom’s puppet. Darvill is so good at hapless comedy with an underlying streak of steel (Remember “Would you like me to repeat the question?”) So much better than all that tortured angst. I really enjoyed Rip for the first time once he became Phil. Just brilliant. But we really need Snart back. I’m trying to imagine the magnificence of Merlyn, Darhk, and Snart (these comic book names kill me) together, all of them unimpressed with each other. Evil Rip has great potential. I’ve never seen Darvill do evil; he’ll probably be fantastic at it. Is Wentworth Miller too busy or something? Because it’s definitely not that the writers shy away from resurrection, not with Merlyn and Sara right there. Snart would have been excellent with kidnapped Phil. Although if Snart had been there, he would have gotten into that bank vault with minimal fuss and they might not have ended up trying to kill each other. Frankly, he might have just decided he didn’t need the others (because of course he wouldn’t), taken Phil, and walked out on them. I miss Snart. The names are pretty bad. Malcolm’s isn’t as unfortunate as the others, although the Merlyn/Magician thing is pretty obvious. I can never remember how to spell Darhk – that h drives me insane. The H goes after the “r”–Darhk–which makes no sense. Comics. Miller is doing Prison Break, but so is Purcell, which may be why Mick had brain surgery this week, so he could shoot elsewhere. Miller’s also a screenwriter, so he has other work. He had last year’s contract written that he’d die in the end or at least be written out, and Purcell didn’t, so they may just have a different approach to insane amounts of work. His contract his year is to appear across the spectrum of shows, but sooner or later he’s supposed to become part of the Legion of Doom–I love how much Sara hates that dumb name–so eventually, it’ll be Merlyn, Darhk, and Snart, which should be excellent value. And actually, he may already be back since Stein theorized Snart might have become one with the universe when the whatsit exploded and that’s why he’s talking to Mick now. If he starts talking to Sara, we’ll know for sure he’s not a hallucination. I love Snart. He’s still my favorite thing about this show. Even though I’ve been really, really enjoying this season, I feel sad watching it because I miss that character so much. I always wonder what he would do in certain situations and what snarky comments he’d have. Can’t wait for him to be back. From what I’ve read it sounds like Thawne will pull Snart from a time before Legends, so he’ll be the villainous Captain Cold from when we first saw him on The Flash. It will be really interesting to see how he reacts to Mick, now that Mick is starting to be a hero. I miss Snart, too. I don’t think he’s back until the last three. Hoping he’s a regular again next year.